“The Prague Spring” had much impact on Latvia's cultural life. Long-awaited theater productions and films were shown in Latvia in 1967 and early 1968. These were dominated by heroes from a new generation who contrasted with the older, Stalin-era generation. Subtexts in poetry hinted at the enslavement of Latvians and Russia's centuries-long imperialistic aspirations in the Baltic region. This budding journalistic freedom frightened the leadership of the Latvian Communist Party (LCP). A bureau meeting of the LCP Central Committee took place on March 26, 1968. In an effort to halt the free thinking, the bureau interrupted the run of Laimonis Purs' play “To See the Sea” (Redzēt jūru) and prohibited the showing of other plays and films. Author Alberts Bels was harshly criticized for his proposal to lift censorship. The LCP often detected echoes of the events in Czechoslovakia in Latvian literary works. Thus Roberts Ķīsis, director of the LCP Central Committee Party Commission, deemed the 1969 collection of poetry “Annual Rings” (Gadu gredzeni) by Vizma Belševica to be based on the events in Czechoslovakia, even though her poems place the tragic situation of the Latvians in the distant past. Belševica was thereafter prohibited from publishing her works for several years. But the existing powers were only able to offer ideology in the form of propagandists and mass media against the day-to-day speech of citizens. Even tourists from abroad had to be handled ideologically and treated to propaganda, although in 1968-1969 it was not possible to convince Czechoslovak tourists of the “brotherly assistance” given to them. 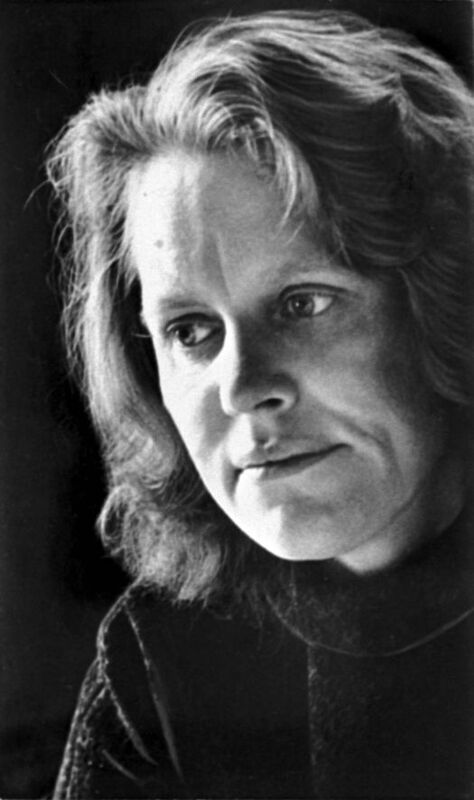 The poet Vizma Belševica (1931-2005) in the 1970s. In her poems Belševica voiced the feelings of Latvians under Soviet occupation and thus gained the mistrust of the authorities. After the release of her collection of poems “Gadu gredzeni”, Belševica was prohibited from publishing poetry and even translations for several years. She was a candidate for the Nobel Prize in Literature. LVKFFDA, arh. nr. 85229N. Photo J. Krieviņš. Excerpt from Vizma Belševica's poem “Indriķa Latvieša piezīmes uz Livonijas hronikas malām” (The Notations of Henricus de Lettis in the Margins of the Livonian Chronicle) from the collection of poems “Gadu gredzeni” (Annual Rings). Riga, 1969. Translated by Baiba Kaugara. LVA, PA-101. f., 33. apr., 4. l., 42. – 43. lp. Author Alberts Bels, who, inspired by the events in Czechoslovakia, proposed the lifting of censorship. Latvia State Archive of Film, Photography and Audiovisual Documents, arh. nr. 46556N. Photo by I. Ozoliņš. State Archives of Latvia, PA-101-33-47, pp. 49. – 52. 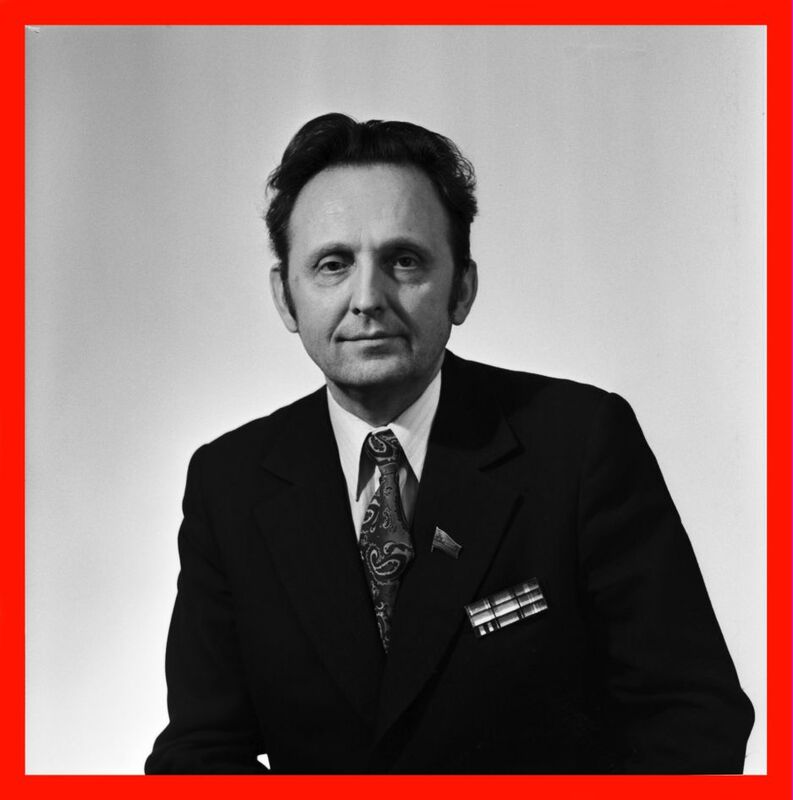 3. to officially reprimand Alberts Jansons, the first secretary of the Soviet Writers' Union and member of the CPSU since 1943, for failing to counter Bels' harmful speech at the republic-wide writers' meeting and for defending several ideologically harmful poems by Auziņš, Kaltiņa, and a few other poets. State Archives of Latvia PA-101-33-35, pp. 14 – 15. 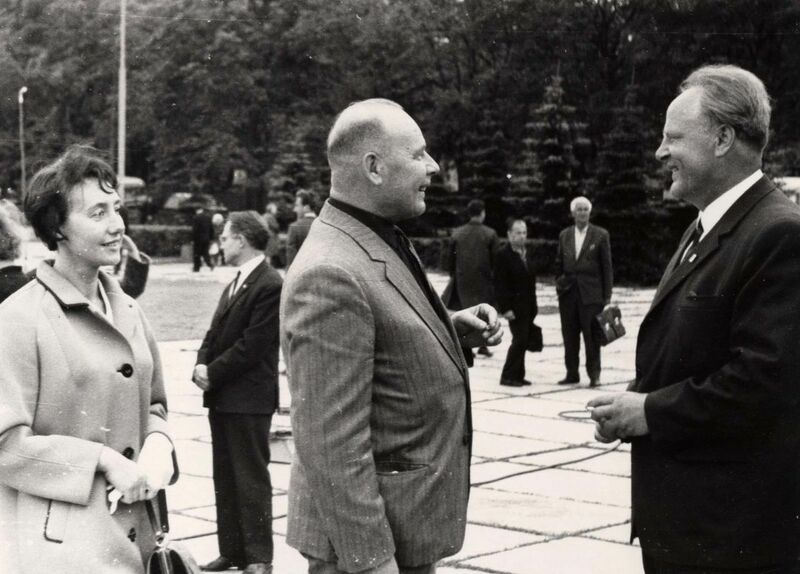 Alberts Jansons (first from right), the first secretary of the Soviet Writers' Union, conversing after a poetry reading by the Rainis Monument on September 10, 1968. Museum of Literature, Theater, and Music (Latvia), nr. 96632. Photo by I. Kākulis. 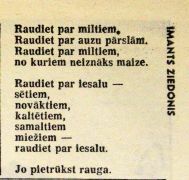 Author Arvīds Grigulis' speech against Imants Auziņš' poem “Pļi! [Fire! ]1905” at the writers' meeting on December 9, 1968, which party employees also attended. State Archives of Latvia PA-101-33-67, pp. 104 – 106. 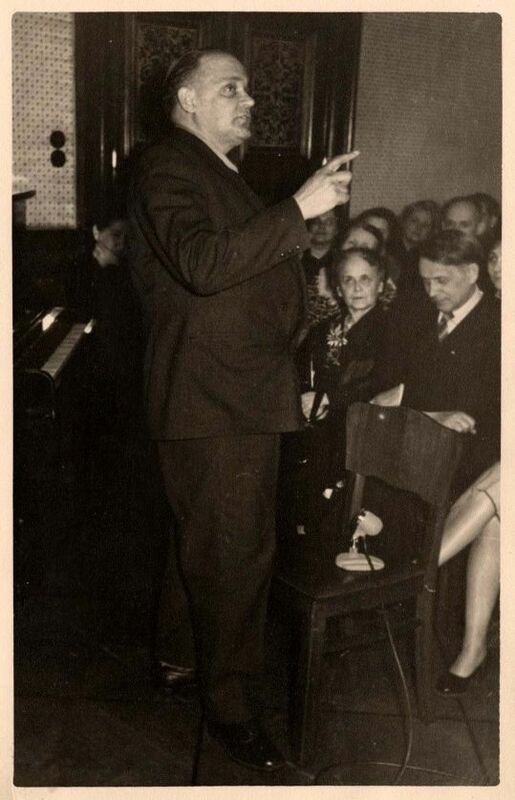 Arvīds Grigulis speaks at a writers' meeting in the 1960s. Museum of Literature, Theater, and Music (Latvia), nr. 167218. 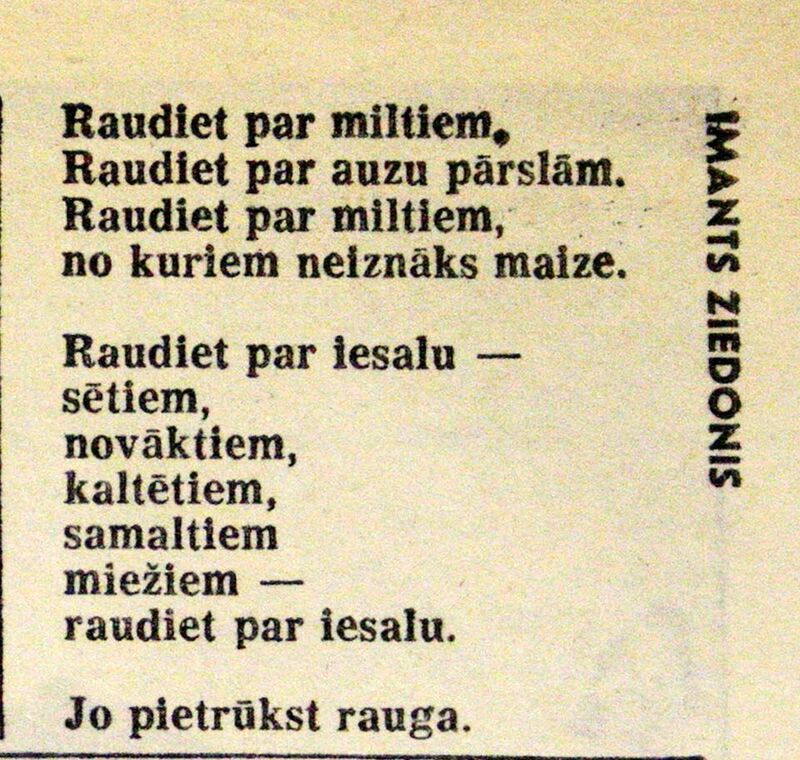 Excerpt from Imants Auziņš' poem “Pļi! [Fire!]1905”. From the collection “Skumjais optimisms”, Riga, 1968. Poet Imants Auziņš, who angered the authorities with his poem “Pļi!”. 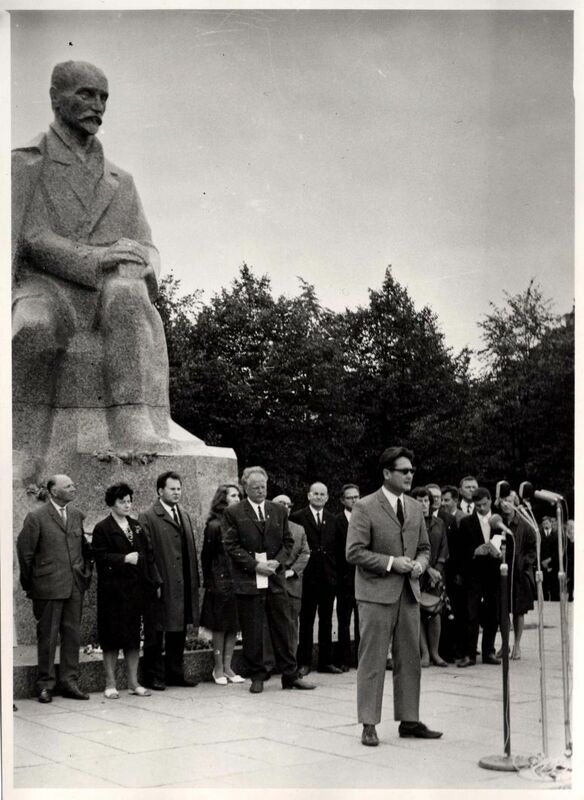 Auziņš is seen here at a Poetry Days event by the Rainis Monument on September 10, 1968. Museum of Literature, Theater, and Music (Latvia), nr. 95626. Photo I. Kākulis. State Archives of Latvia PA-101-33-67, p. 102. 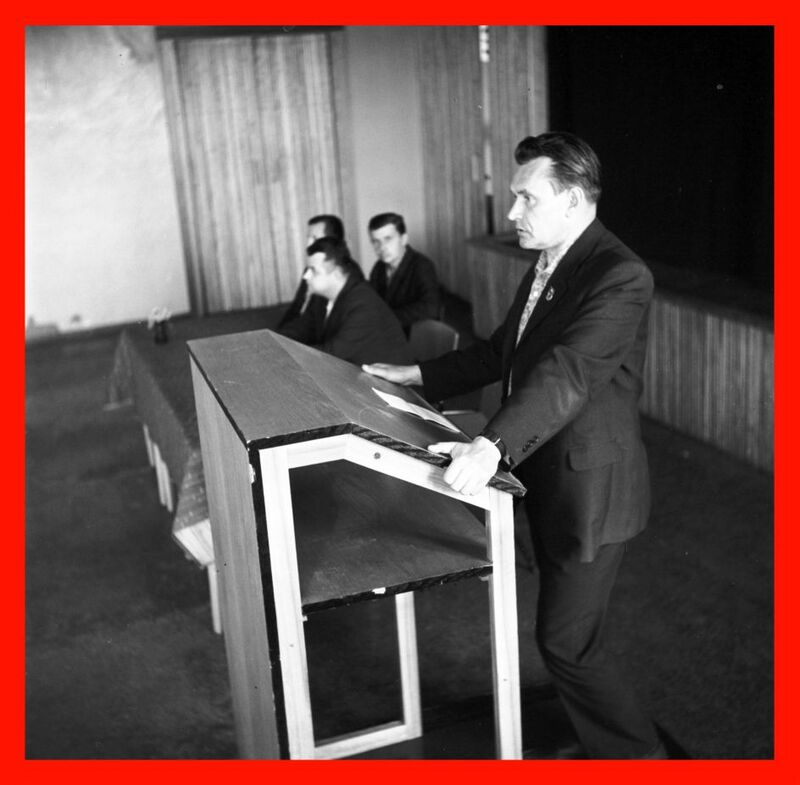 Augusts Voss, first secretary of the Central Committee of the Latvian Communist Party (LCP), delivering a speech in the late 1960s. Latvia State Archive of Film, Photography and Audiovisual Documents, arh. nr. 62969N. State Archives of Latvia PA-101- 32 - 43, p. 235. 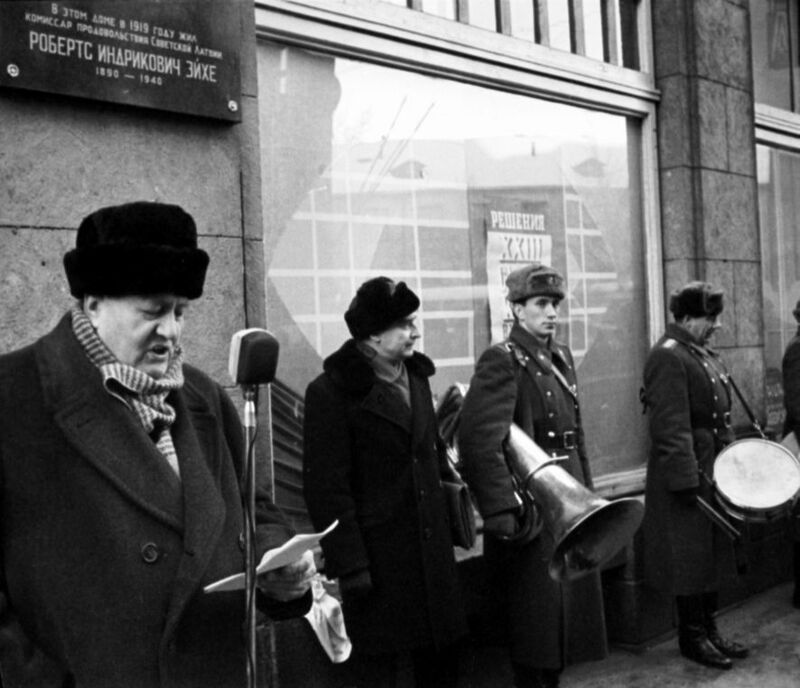 The March 26, 1968, project of decision by the LCP Central Committee bureau “Regarding the Latvian SSR Ministry of Culture's deficiencies in theater repertoire development”. The decision firmly reprimands Vladimirs Kaupužs, the Minister of Culture, for allowing a production of the “ideologically harmful” play “Redzēt jūru” by Laimonis Purs at the Academic Drama Theater. It also demands tighter control of the theater by the Ministry of Culture. As a result of this decision, several plays and films were cancelled or banned in Latvia. State Archives of Latvia PA-101-32- 43, pp. 191 – 192. The Academic Drama Theater stages a production of Laimonis Purs' play “Redzēt jūru”. 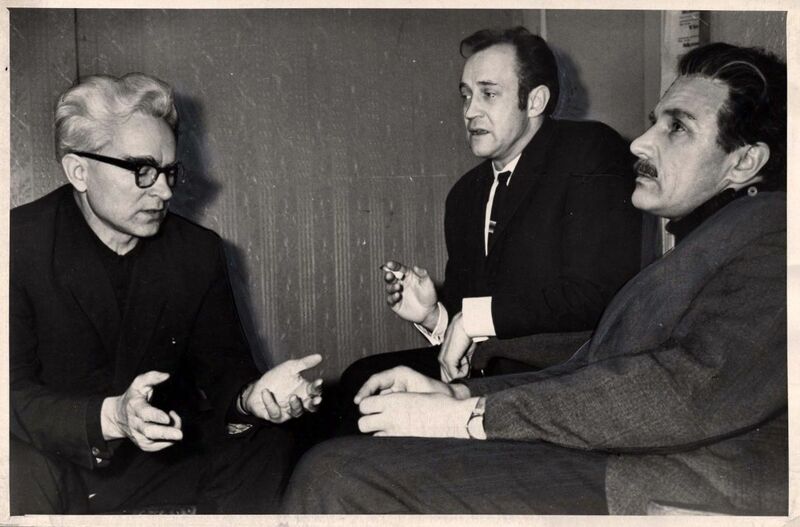 From the left: author Laimonis Purs, director Jūlijs Bebrišs, and actor Jānis Kubilis. Museum of Literature, Theater, and Music (Latvia), nr. 577013 a. Photo by D. Gedzjuns. Museum of Literature, Theater, and Music (Latvia), nr. 252706. Photo by D. Gedzjuns. 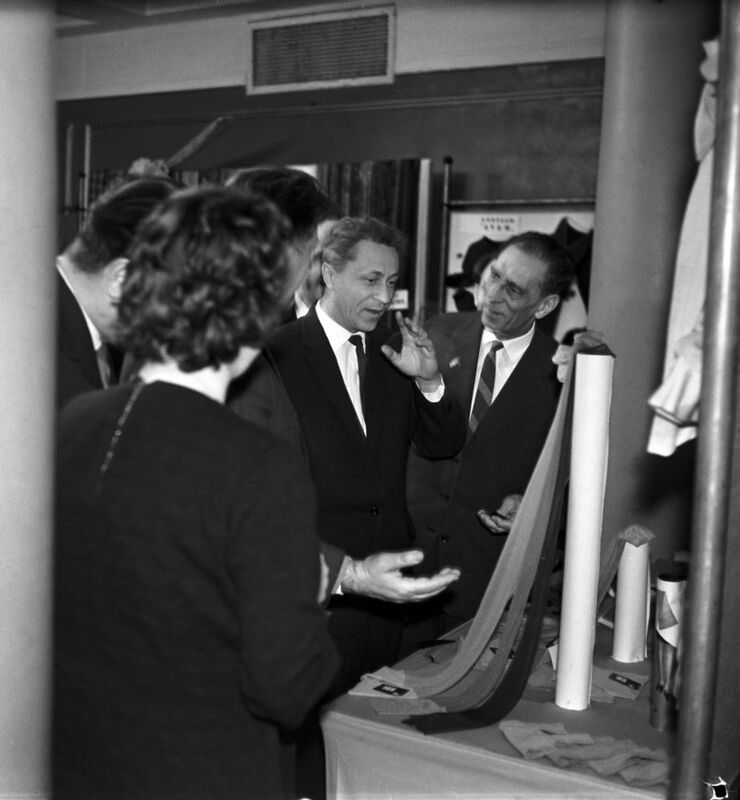 Nikolajs Beluhs (first from left), second secretary of the LCP, with participants of the LCP Central Committee's general meeting in the 1960s. Latvia State Archive of Film, Photography and Audiovisual Documents, arh. nr. 4878 I. Photo by S. Daņilovs. State Archives of Latvia PA-101- 32- 43, p. 229. State Archives of Latvia PA-101- 32- 43, p. 233. 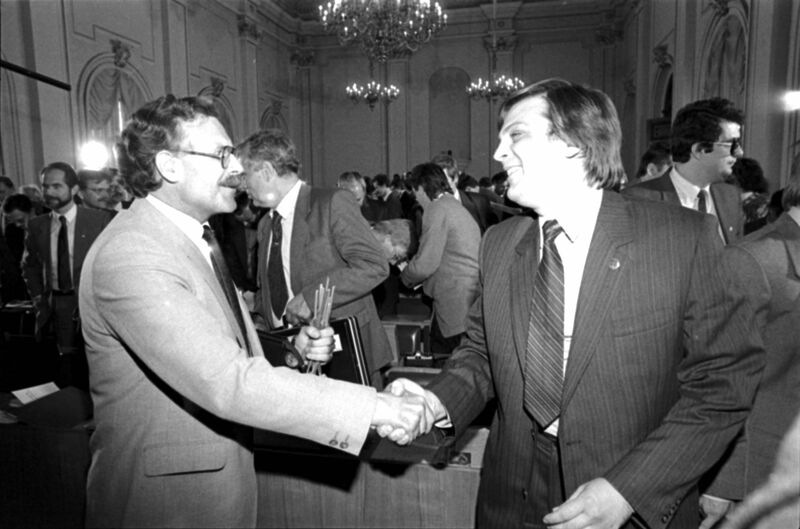 Ilmārs Īverts, member of the Latvian SSR Supreme Council and chairman of the State Radio and Television Council. Latvia State Archive of Film, Photography and Audiovisual Documents, arh. nr. 9042-I. Photo J. Tihonovs. 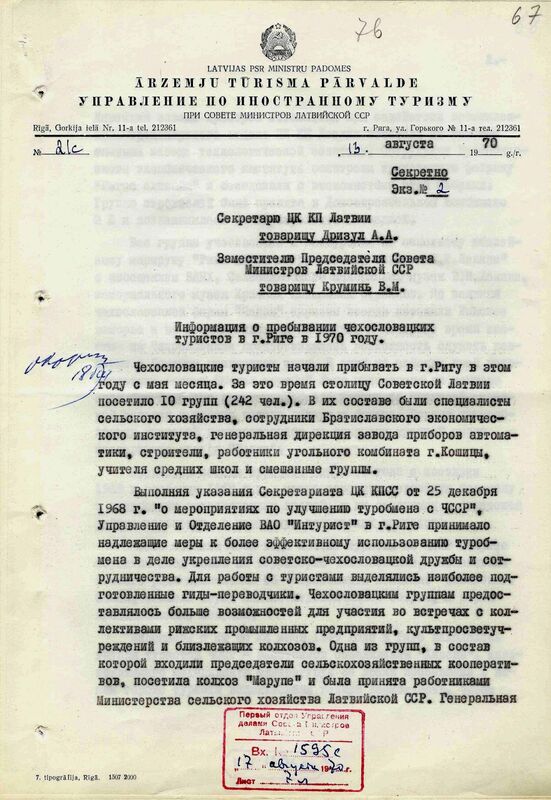 The statement by Ilmārs Īverts at the July 29, 1968, LCP Central Committee bureau meeting titled “Regarding the state of contemporary Latvian soviet art literature and activities in its further development”. State Archives of Latvia PA-101- 32 - 49, p. 155. State Archives of Latvia PA-101-32- 43, pp. 229 – 230. 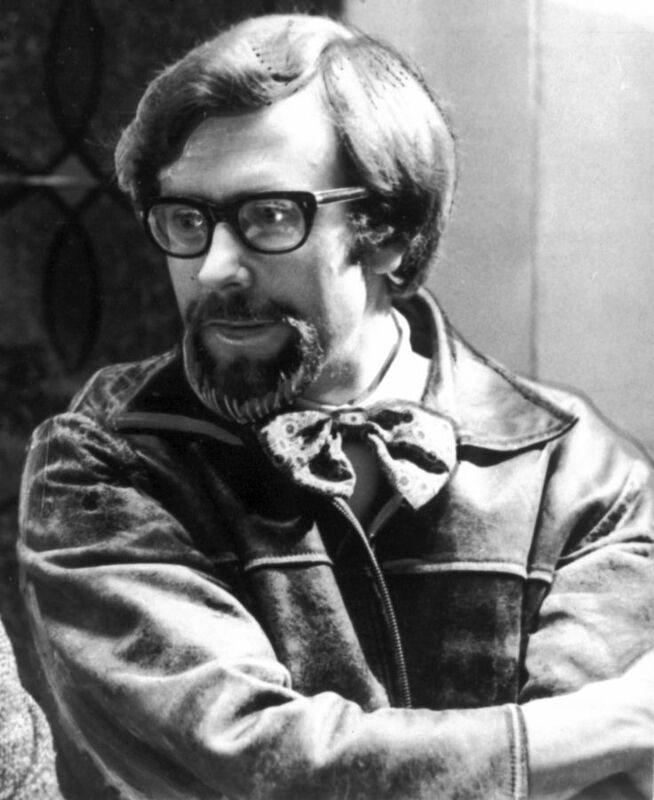 Gunārs Priede, a playwright whose play “Smaržo sēnes” (The Sweet Smell of Mushrooms) (1967) became the only play to be banned in Soviet Latvia. Museum of Literature, Theater, and Music (Latvia), nr. 341638. 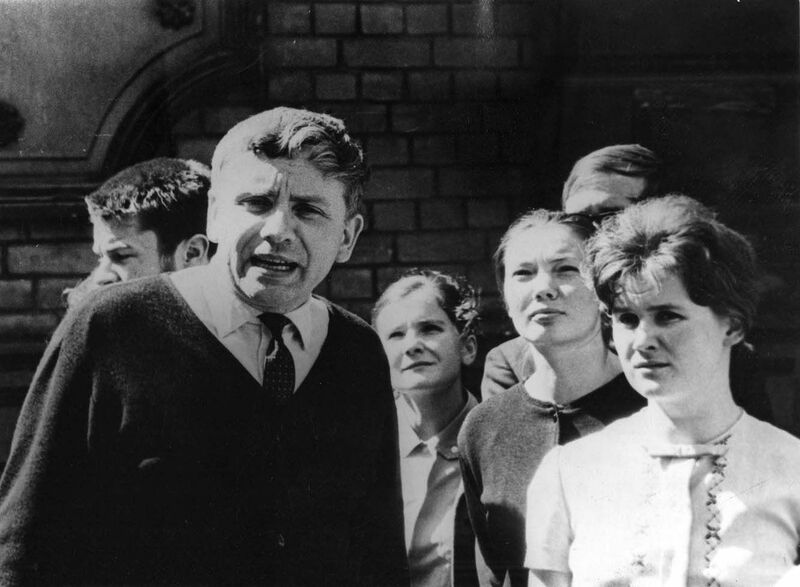 Gunārs Priede leads students from the Department of History and Philology at the State University of Latvia on an excursion through Riga in autumn 1968. 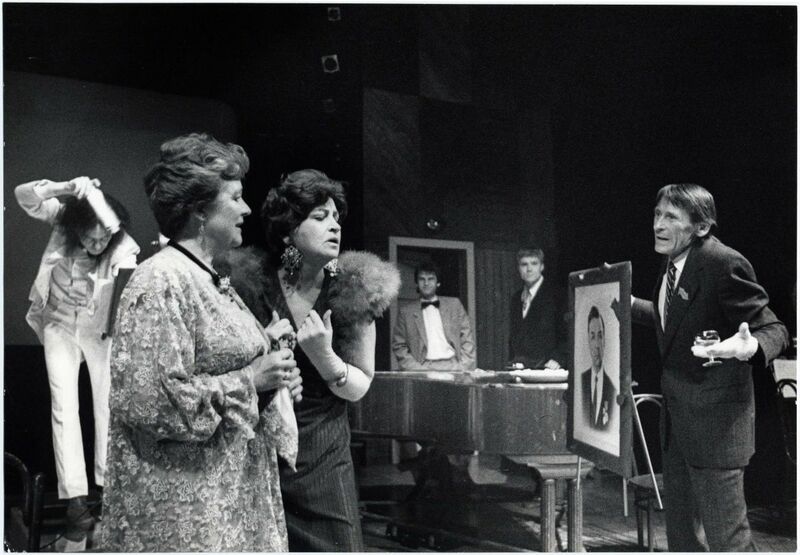 A scene from Gunārs Priede's play “Smaržo sēnes” at the Latvian SSR State Youth Theater. 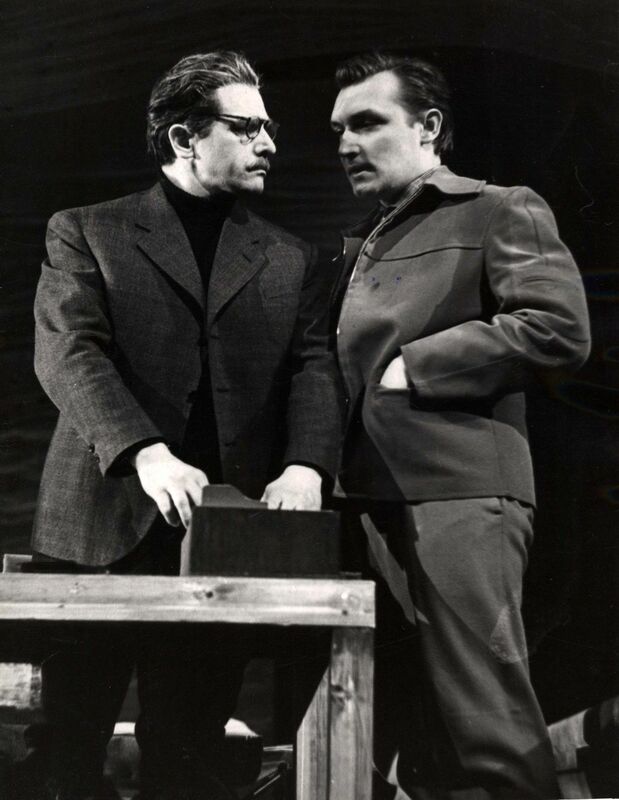 The play portrays the disparity between Soviet ideals and reality, and was eventually banned until 1988. Museum of Literature, Theater, and Music (Latvia) nr. 584581. State Archives of Latvia PA-101-32- 43, p. 215. 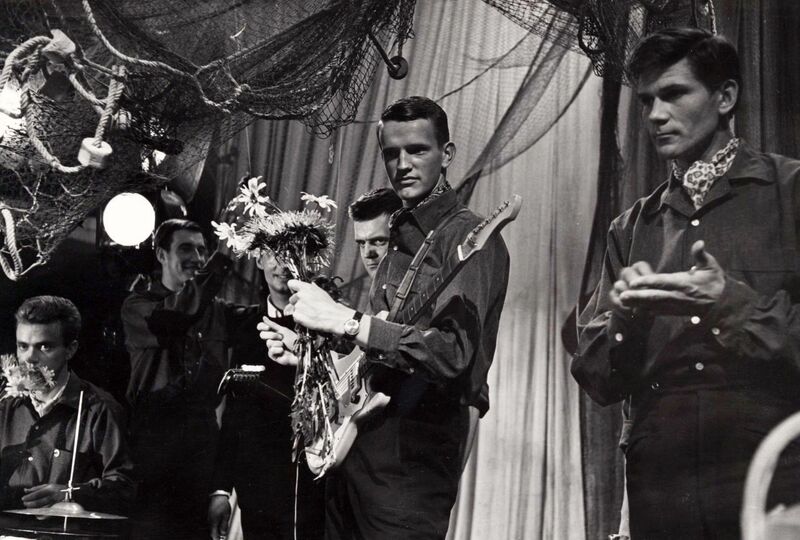 A scene from the Riga Motion Pictures Studio film “Četri balti krekli” (Four white shirts) (1967), based on Gunārs Priede's play “Trīspadsmitā” (The Thirteenth). The play deals with rebellious youths protesting censorship. Museum of Literature, Theater, and Music (Latvia), nr. 500389. State Archives of Latvia 101-32-43, p. 225. The informative report by Edmunds Ratnieks (chairman of the Latvian SSR Supreme Council Tourism Board) to LCP Central Committee secretary Aleksandrs Drīzulis and vice-chairman of the Latvian SSR Supreme Council Viktors Krūmiņš about the arrival in Riga of Czechoslovak tourists in 1970. The report describes the anti-Soviet mood of individual tourist groups as well as anti-Soviet comments and provocative questions posed to tour guides. One of the tour groups spent evenings by the Freedom Monument, where Ilya Rips set himself on fire in 1969, stating that “we have a club of our own at this site of self-immolation”. The report also states that the Tourist Board will strictly control Czechoslovak tourist groups. State Archives of Latvia, 270-1c- 2034, pp.67 – 73. 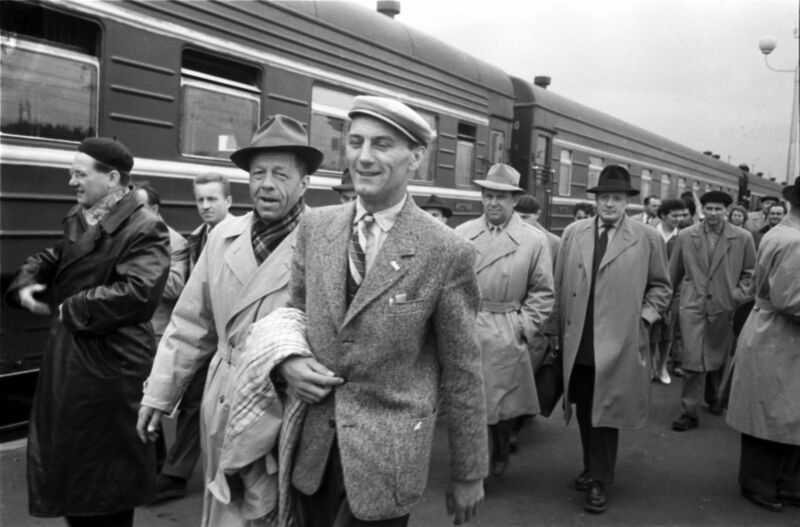 A group of Czechoslovak tourists at the Riga Railway Station in the 1960s. Latvia State Archive of Film, Photography and Audiovisual Documents, arh. nr. 15943N. Photo by N. Šiklovs. A festive welcome at the Riga Railway Station for participants of a Czechoslovak and USSR friendship tour. Latvia State Archive of Film, Photography and Audiovisual Documents, arh. nr. 73810. Jānis Vagris, the first secretary of the LCP Liepāja committee. Latvia State Archive of Film, Photography and Audiovisual Documents, arh. nr. 5957 I. Photo by V. Ēvaldsons. 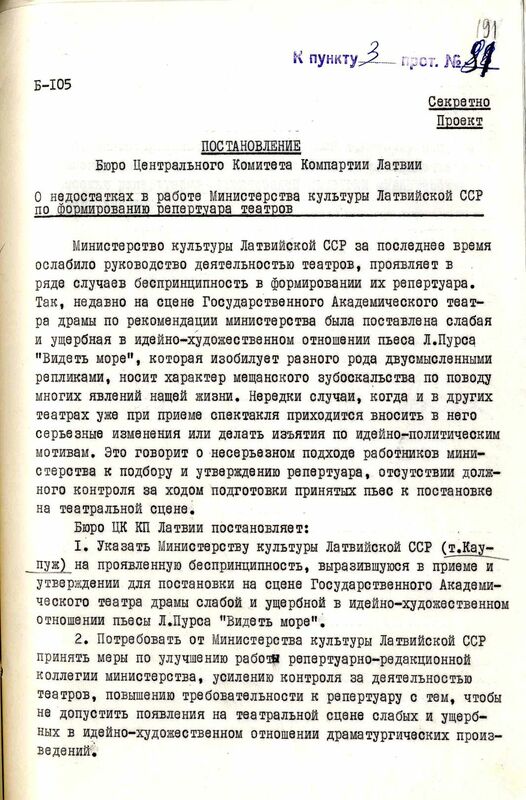 An excerpt from the transcript of the 9th general meeting of the LCP Central Committee on November 26, 1968, titled “Regarding the foreign policy activities of the CPSU Central Committee Politburo”. At the meeting Jānis Vagris, first secretary of the Liepāja party committee, spoke about how socialism was being threatened with the onset of an internal counter-revolution in Czechoslovakia. 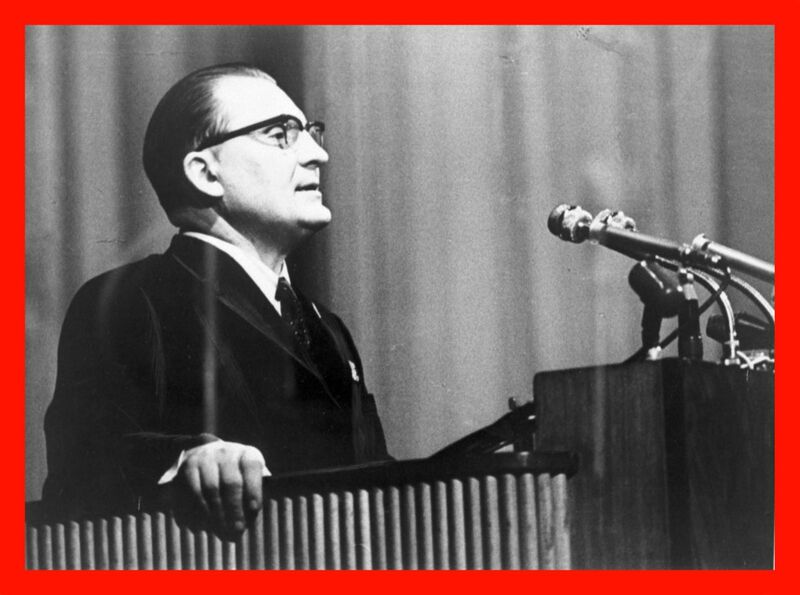 Also, the leaders of the Czechoslovak party and state were not able to cope with the current situation and the assistance provided by the USSR military was correct and well timed. State Archives of Latvia PA-101- 32- 6, p. 101. 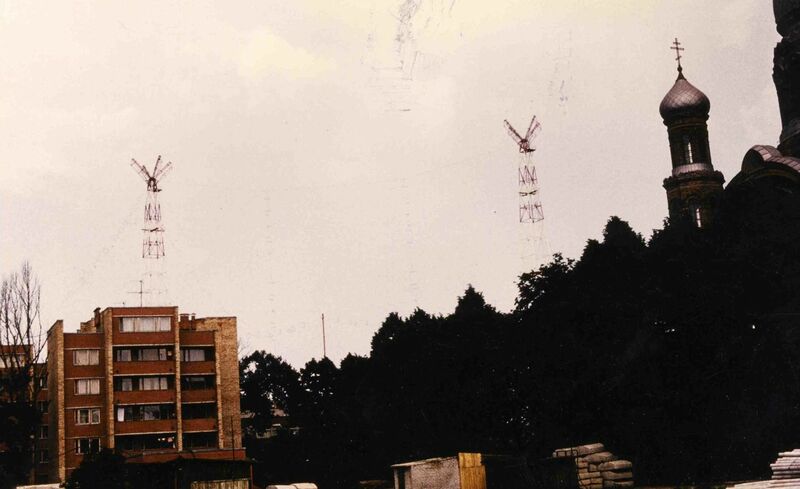 Towers set up on a Soviet military base for scrambling radio broadcasts. State Archives of Latvia 2197- 1-v- 31, p.3.